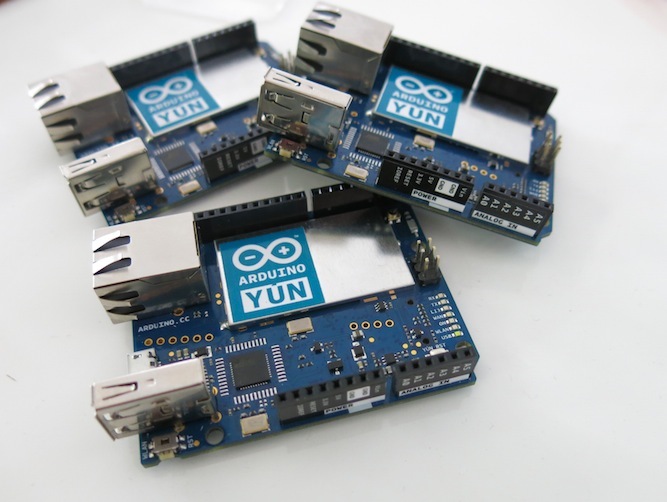 Following the announcement of the new Yún image, we are happy to announce two new features of the Arduino Yún. The first feature allows you to use a micro SD card as a replacement for the Yún’s internal flash memory. We have a tutorial that demonstrates how using this expands your Yún’s free disk space from the original 7 Megabytes to the available Gigabytes of your SD card. Having more disk space allows you to make more complex projects, like activating webcams and saving pictures taken with it. In addition, by using an external SD card you avoid using the internal flash memory, thus extending the life of your Yún. To upgrade your Yún to access this feature, follow the tutorial. Report back to the Arduino Yún forum if you have any issues or questions. The second new feature is the availability of Node.js as an installable package. In order to install Node.js on your Yún, use the Arduino IDE to upload the YunSerialTerminal example or access your Yún via SSH. And voilà! You’ve got Node.js on your Yún. It will gives you the wrong hash. 1) Why do you use dm-dev-mipsbe instead of dm-mipsbe-3.14 that is better? 2) If you are interested I made a fix (a small change in the nodejs source code) for the hashes bug. is there a procedure to revert? I would like to adjust the space that I initially alloted 🙂 thanks in advance! Is this not still installing to the flash? Have I missed a step to install Node to the SD card, as I’ve already run out os space. Guys, it’s easy! just copy the node files in your sd and make a soft link. No problem! When I have time I will clone the actual nodejs source in my github and insert the hashes fix. If you want I let you know when. Sorry did you do opkg update before opkg install …? 2) yes i did opkg update before trying to install it. Did anyone had success installing this package? @bast64 – did you activate the swap partition? In my case this was the solution. Otherwise i was not able to compile the node modules. @biosbob, are you getting “invalid server key” if you try to open a WebSocket between the Yun and a computer? Does this mean I can update my Yun boards in the field with new sketches (hex files) simply by inserting an updated SD card?